The School at Peridance's Dance Camp is an exciting and action-packed two weeks for your dancer to keep moving this summer. The Camp will include daily technique classes in Ballet, Modern, and Jazz as well as elective classes such as Hip Hop, African, and Musical Theater. In addition, campers will learn elements of choreography and composition in order to create their own exciting dance piece as a team! The Camp will conclude with a studio performance to showcase the campers' own choreographic creations, artistry, and technique! 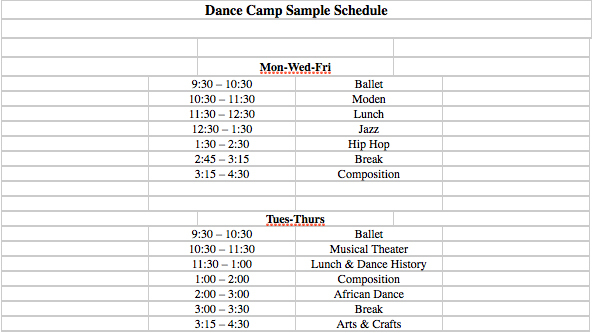 Camp is held indoors at Peridance Capezio Center in our air-conditioned dance studios. Students are primarily dancing the entire day - however weather permitting, bi-weekly trips are taken to local parks for some summer play as well! Please note that early drop-off is available starting at 9:00 am and late pick-up is available until 5:00 pm by advance notice and additional fee only. This camp is for students who are 6.5 - 10.5 years of age. While it is not required, it is highly encouraged that dances have some prior experience dance before attending camp so that they already feel comfortable in a dance class. Students are split into two camp groups based on age for their primary technique classes, and also come together for some workshops and classes such as Dance History or Arts & Crafts. No auditions are required; all levels are welcome.